We had a very busy weekend around the Gilead…old friends visiting for the first time, new friends coming to document the event, neighbors lending a hand, everyone learned something new, it was great. Adrianne is a real photographer and took a zillion photos, so I’ll post some of hers later in the week, for now, you just get my crappy snapshots to hold you over. I’ve reconnected with an old friend from elementary school, and he and his partner came to visit us just in time to catch our first shearing. My neighbor John, came down on Friday to do the honors. He did Nola and Varitek in the morning, since Zach and Mike were needing to head out later in the day. Nola and Varitek were pretty calm about the whole thing, not giving John too much of a hard time. He normally shears sheep, and the goats have much looser, wrinklier skin, so he didn’t go quite as short as Jeff did last Fall. There was one small nick on Nola, but nothing to worry about. After they were shorn and John went off to pick up his new motorcycle, and I trimmed hooves, and applied delouser. We enjoyed the antics of the goats and the sunshine for a time, then they had to be on their way. A freshly shorn goat is a funny critter. They seem really elated to be naked, prancing around, tail going a thousand miles an hour, until they encounter the unshorn goats. Then it’s crazy sniffing, and head butts all around. It’s as though they don’t know each other without their fleece. A whole new round of jockeying for position in the hierarchy of the herd happens. It’s quite entertaining to watch. Later in the day Adrianne arrived and we got right to taking some photos. 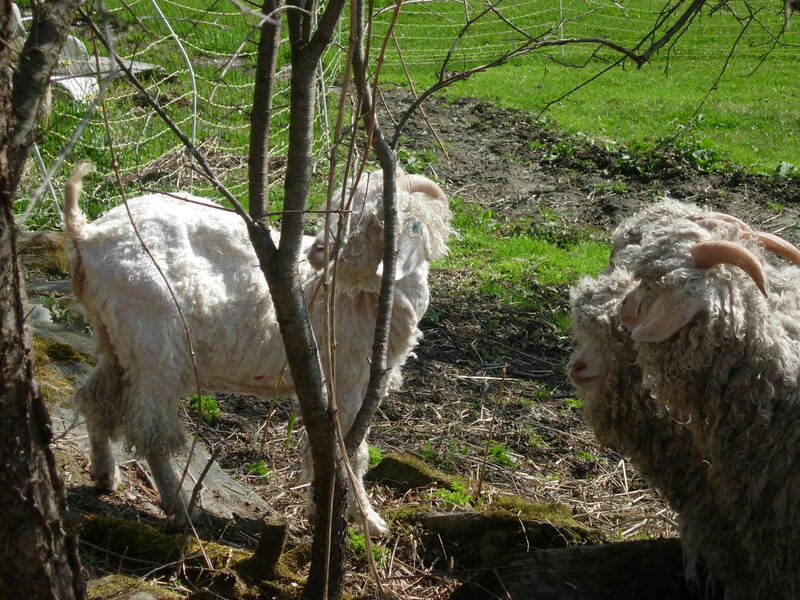 We were just finishing up Tallulah and Seymour’s before pics when John arrived to finish the shearing. Seymour howled like we were torturing him through the entire shearing, though he didn’t get a single nick. Tallulah was pretty good once we caught her, but she was done with the process a little sooner than John, and has some random long bits left. I’ve been trying to catch her to trim her up so she doesn’t look so goofy, but she’s decidedly distrustful of me right now. But, they all got their haircuts, and the fleeces are unbelievably soft, shiny and fine. Very dirty, but soo lovely. I’ve been washing up small bits from each fleece to evaluate, along with small amounts of several different kinds of fleece I have on hand. I’m planning to card up some combinations and blends and see if I have what I need for a nice yarn from them or if I need to get some better fleeces at the NH Sheep and Wool Festival in a couple of weeks. Adrianne and I spent a lot of time this weekend brainstorming all the possibilities for their fleece, roving, yarn, locks, blends, to dye or not to dye. I think I’ve come up with a plan for how I want to proceed, and just need to continue sampling to see if it will work. More on that later as I work it all out. The other really exciting thing is that I actually finally got my shearing lesson. John had been waiting for his blades to come back from the sharpener, which is why I didn’t get my lesson before my goats shearing day, and they finally came back this weekend. So, on Sunday I went up to his farm (just up the road about a mile) and helped him shear a batch of his ewes. After watching carefully for a couple of sheep, I tried my hand. First I just did a couple of the bellies, and let John finish up. Then he did the bellies and I tried the neck and back on one side, he finished the other. Then after taking turns on a few ewes til I felt like I wasnt’ going to shred the poor sheep, I did 2 ewes completely on my own. Man, that is hard work. I was sweating, my glasses were falling off, my arms (especially the left one) were aching, but boy did I feel good. It was very satisfying to be able to get the whole fleece off in (nearly) all one piece. Granted, the unlucky sheep that got my first tries at a complete shearing look a little funnier than the rest of the girls, but they are cooler, and I learned so much from them. I have a whole new appreciation for shearers, and people, if you have a good shearer, you should treat them like gold. I’ll continue to help John out with his sheep as long as he’ll let me. I’m still sore and achy today, 2 days after the fact, but I’m sure that with practice I’ll get better (and faster) at it. I owe John a huge thanks for allowing me to practice on his flock, and for being a good and patient teacher. 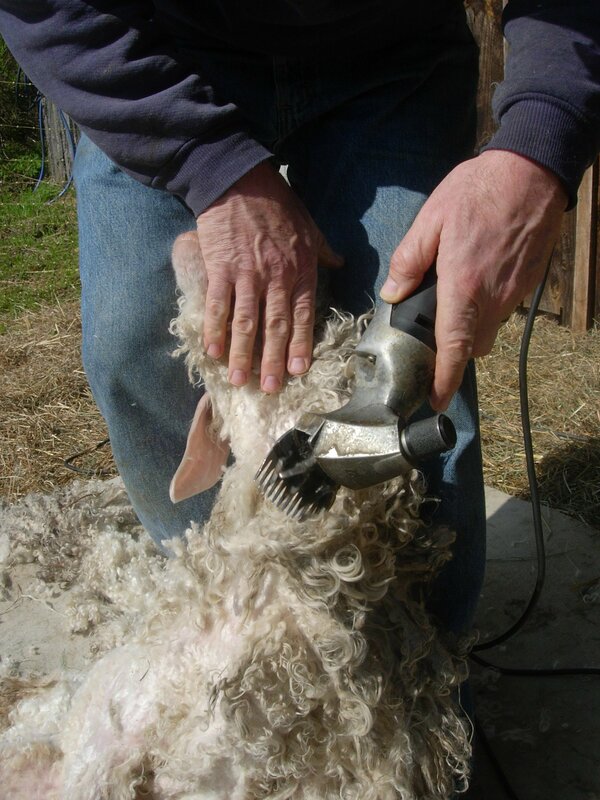 I’m not sure that I could stand to watch a total beginner shear my animals, he was gracious and kind throughout. More and better photos to come, later in the week. great post! congratulations on this big new step! Congratulations on your first shearing! Enjoy the fruits of your labor. I can’t wait to see more pictures! Great post. I totally agree. I almost feel like I was there watching. Thanks for taking the time to describe it all, and good for you. Sounds like a very demanding art to learn and you’re on your way. How lovely! Great job…and they are nekkid!